The French film Séraphine stars Yolande Moreau as the 20th century artist Séraphine Louis–a poor housekeeper/painter who was discovered in 1912 by the German art collector Wilhelm Uhde. Uhde was only able to give Séraphine minor support before he had to flee France due to the war, but he eventually came back to France and happily found that Séraphine was not only alive, but had continued her painting. He immediately became her lead patron, giving her an allowance and finding exhibitors and buyers for her work, until the world economic woes hit the art world and Séraphine’s mental instabilities paralyzed her painting. I absolutely love to watch people paint–from Bob Ross to Jackson Pollock to craftsters on Martha Stewart–and so I also love films about painters since they often include a variety of short and long scenes where the artists fervidly creates their famous masterpieces. 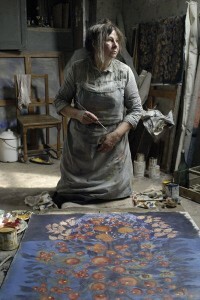 However, the greatest part of this film is not watching Séraphine’s actual painting (although that is fantastic), but seeing her gather pigments and create her own paints (for example: stealing hot wax from the church’s prayer candles). The artist never revealed her methods of creating her vibrant colors, but the film’s version of her ingenuity is, nonetheless, absolutely fascinating! Lacuna: 1)an empty space or a misssing part 2) a cavity, space or depression. This new novel by Barbara Kingsolver was worth the wait — it’s been nine years since her last novel, the very popular and acclaimed Poisonwood Bible. 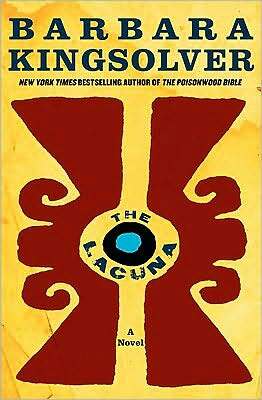 The Lacuna takes place in both Mexico and the U.S. with most of it written in journal format. Kingsolver also throws in some actual newspaper articles and other documents which add credibility to the time period (the 1930’s, 40’s and 50’s). The main character, Harrison William Shepherd, is the son of a dull Washington bureaucrat and a flamboyant Mexican mother, who has left her husband to live with a current lover on a Mexican island. Without school or friends to occupy his time, Harrison spends many hours swimming, where he discovers a lacuna in a sea cliff which leads to a secret, hidden pool. As Harrison matures, his particular set of skills gains him employment with the famous artists, Diego Rivera and his wife, Frida Kahlo. Since they later harbor the exiled communist Leo Trotsky, Harrison ends up working as a secretary for him as well. This part was especially interesting — perhaps because of the real personages in the book, it was easy at times to forget that this was a work of fiction! After Trotsky’s murder, Harrison comes back to the United States (accompanying some of Frida’s paintings) and settles in North Carolina, where he finally realizes his dream of writing romantic adventure novels. He becomes a hugely popular author, but his luck turns sour when he is later cited as a Communist sympathizer. It’s not until the ending that we discover the significance of the title. As both Kahlo and Shepherd are fond of saying, “The most important part of the story is the piece you don’t know.” Read it and enjoy finding out for yourself.